Learn how to clean yellow pillow stains and restore them to brand new. It’s easy when you know how. You are going to love the Pro results. Watch the video tutorial now. Nothing compares to a clean fresh bed. Unfortunately, it is short lived. One of the most common complaints is the unpleasant issue of yellow pillows. Whilst your natural reaction may be to throw them out, today we share how you can restore them to new. There are many reasons why pillows yellow and it is actually recommended that you wash your pillows at least twice a year. Sickness and night sweats are two of many challenges. According to One Good Thing By Jillee, you can successfully clean your pillows and restore them to their former glory. Just look at the results that are achieved in the photos above. This clever trick will save you money. It’s also a great way to repurpose and do your bit for the planet in the process. Jillee has the most brilliant household hacks on her website and there’s a reason that this one has been so popular. Arm & Hammer also have this excellent tip for fluffing up your pillows with a tennis ball. This will plump them up. 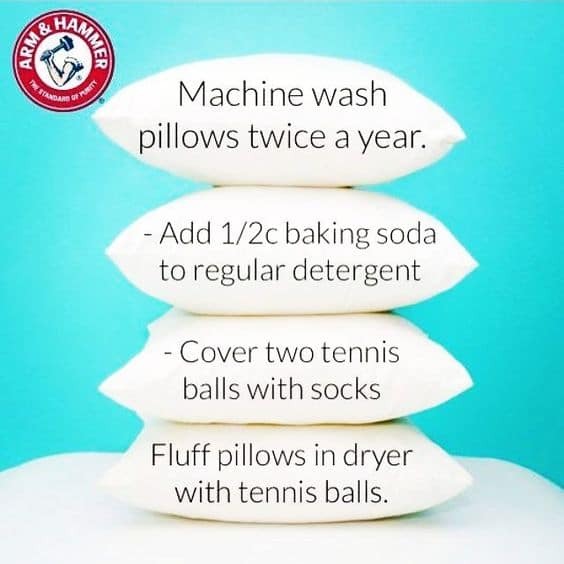 All you need to do is add 1/2 a cup of baking soda to regular detergent, cover two tennis balls with socks and then fluff your pillows in your dryer. This really does work great! Jillee suggests you wash two pillows at a time. She also takes them out and turns them over. You want to ensure you are using very hot water. You should go through the wash cycle twice also. Jillee also references her Miracle Whitener in the video and you can find the details in her post and view our article that shows you how often you should be cleaning similar items in your home here.